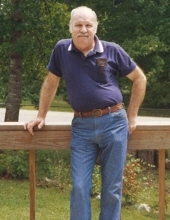 Thomas "Pete" Marion Thrash, Sr. Celebrating the life of Thomas "Pete" Marion Thrash, Sr.
Be the first to share your favorite memory, photo or story of Thomas "Pete". This memorial page is dedicated for family, friends and future generations to celebrate the life of their loved one. Obituary for Thomas "Pete" Marion Thrash, Sr.
Thomas “Pete” Marion Thrash, Sr., age 80, of Powder Springs, GA, formerly of Lithia Springs, GA, passed away on Thursday, March 28, 2019. He was born on December 28, 1938 in LaGrange, GA, son of the late Jesse Carl Thrash and the late Beulah Estelle Benefield Thrash. Pete retired from General Motors where he was employed for 32 years. He was a member of Full Gospel Church in Lithia Springs. Pete is survived by his wife of 59 years, Shirley (Priest) Thrash; children: Tammy Leatherwood, Tracy and Mike Sturdivant, Tom and Cyndi Thrash; grandchildren: Stephanie Gravitt, Dylan Sturdivant, Chris Leatherwood; great granddaughters: Mary Gravitt and Tammy Gravitt; brother: Jerome Thrash; sisters-in-law: Aillene Cooper and Helen Florence; numerous nieces and nephews. In addition to his parents, he was preceded in death by two sisters and two brothers. The family will receive friends at Hightower’s Memorial Chapel on Sunday, March 31, 2019 from12:00 PM until 3:00 PM. Funeral Services will be held at 3:00 PM on Sunday March 31, 2019 in the Chapel of the funeral home with Reverend Thomas Kelly and Reverend Phil Moore officiating. Interment will follow at Sunrise Memorial Gardens in Lithia Springs, GA.You may share your thoughts and condolences online at www.hightowersmemorial.com.Hightower’s Memorial Chapel, Douglasville, has charge of the arrangements. To send flowers or a remembrance gift to the family of Thomas "Pete" Marion Thrash, Sr., please visit our Tribute Store. "Email Address" would like to share the life celebration of Thomas "Pete" Marion Thrash, Sr.. Click on the "link" to go to share a favorite memory or leave a condolence message for the family.